How common is a congenital heart disease? What are the different types of congenital heart defects in babies? What are the causes of congenital heart diseases in babies? What are the risk factors of developing congenital heart defects? What are the symptoms of a congenital heart disease in babies? Can congenital heart defects be diagnosed during pregnancy? Can congenital heart defects cure on their own? Are there ways to prevent congenital heart defects? Congenital heart diseases are among the most serious ailments that affect infants. As the name suggests, the condition is present right at birth or develops shortly after that. There are different types of congenital heart defects, with the course of treatment varying for each. The prognosis is also unique. 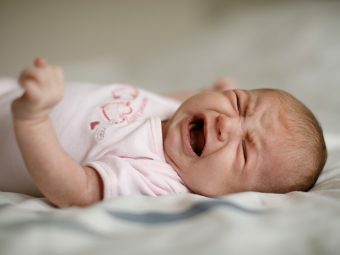 In this MomJunction post, we give all the information about congenital heart defects (CHD) in babies and how to deal with them. A congenital heart disease is a collective term used to describe different heart abnormalities present in a baby at birth (1). They are categorized based on their complexity and the impact they have on the body. Often the circulatory and respiratory systems are the most affected by a defect in the heart. A congenital heart disease is the most common type of birth defect among infants. It happens in about eight out of 1000 babies. According to the US Center for Disease Control, congenital heart defects affect about 1% of births or approximately 40,000 babies in the US each year (3). About 25% of congenital heart defect cases are critical. CHDs are the leading congenital illnesses resulting in death among infants. Advancements in medicine have increased the rate of survival to 85%. Medical experts state that the most CHDs now are seldom terminal and mostly chronic. So the conditions may not be fatal, but a baby will have to live with them for the rest of their life. The severity of the condition depends on what part of the heart is affected. Atrial septal defect (ASD): There is a hole or a small opening in the membrane that separates the atria, which are the upper chambers of the heart. This results in the mixing of the oxygenated and deoxygenated blood. Ventricular septal defect: A hole in the tissue separates the right and left ventricles, also resulting in the mixing of oxygenated and deoxygenated blood. Atrioventricular canal defect: Also called atrioventricular septal defect, this is similar to the atrial and ventricular septal defect. Babies with this condition have a hole in the membrane separating both ventricles and atria, which result in the improper formation of the valves that control the flow of blood through these chambers (6). Coarctation of the aorta (CoA): This is a critical condition where the aorta, the largest artery of the body, becomes narrow. The aorta is the main artery that originates from the heart to distribute oxygenated blood to all other parts of the body. Hypoplastic left heart syndrome (HLHS): Also a critical condition, the left side of the heart is not developed properly, which means the left atrium and ventricle may not be able to pump blood adequately (7). Pulmonary atresia: It is a critical condition where the pulmonary valve is poorly formed or is not formed at all, thus leading to complications. The pulmonary valve is a blood vessel that carries deoxygenated blood from the heart to the lungs (8). Pulmonary stenosis (PS): The pulmonary valve is made of three tissue membranes that control the flow of blood through the valve. In pulmonary stenosis, two out of three membranes are stuck together to form a thick section, which inhibits the smooth flow of blood from the heart to the pulmonary artery (9). Tetralogy of fallot: A critical condition, this is a combination of about four heart defects together. In this rare condition, the heart may not form correctly (5). Total anomalous pulmonary venous connection (TAPVC): Also called total anomalous pulmonary venous return, this is a critical condition where the pulmonary vein that brings oxygenated blood from the heart does not attach to the left atrium. Instead, it connects to the right atrium, which carries the deoxygenated blood (10). It means the body does not get adequate oxygenated blood. Transposition of the great arteries: A critical condition where the position of the pulmonary artery and aorta is switched. This leads to the circulation of deoxygenated blood instead of oxygen-rich blood to the different parts of the body. Tricuspid atresia: In this critical condition, the tricuspid valve that sits between the right atrium and right ventricle may have some defect or is missing entirely (11). Truncus arteriosus: This is also a critical condition where the pulmonary artery and the aorta start as a common blood vessel before branching out. It means the oxygenated and deoxygenated blood get mixed before they are pumped to the body. 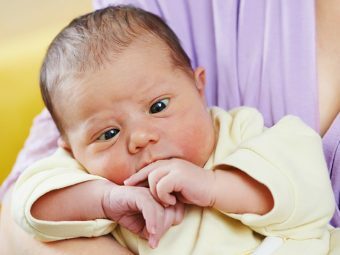 Keep reading to know what causes these heart defects in newborns. The exact cause of heart defects in babies is not known. However, experts believe it is primarily a combination of genes and the influence of maternal health on the fetal development that eventually results in congenital heart defects. Nevertheless, no single reason can be attributed to the development of a congenital heart disease. However, some situations, conditions, and scenarios can increase the chances of the baby being born with congenital heart defects. Family history: Heart defects could be a result of a defective gene or a chromosome that could run in families. If the parent or a sibling has a heart defect, then the chances of the baby being born with a heart defect are higher. Maternal lifestyle during pregnancy: Certain lifestyle choices of the mother, such as smoking, drinking alcohol, and narcotics consumption, during pregnancy can increase the risk of heart defects in the fetus (13). Maternal illnesses and medication: Some diseases during pregnancy increase the chance of the baby being born with a heart defect. Examples include chronic illnesses like diabetes and pathogenic disease like rubella. Certain medications taken during pregnancy may also put the fetus at risk of heart problems. Environmental factors: Exposure to air or food contaminated with heavy metals can cause fetal defects. For instance, inhalation of lead dust during pregnancy and consuming water contaminated with arsenic is widely blamed for congenital disabilities (14) (15). Other congenital problems: If the baby has other congenital problems, then a heart defect could co-exist. For instance, congenital heart defects are quite commonly seen in those with Down syndrome (16). Identifying the symptoms of CHD in babies may help you get timely treatment. Bluish tinge to the skin. It is most noticeable on the lips, nails, and the tongue. This condition is called cyanosis. Inability to feed properly and poor appetite. Problems in breathing and a chronic increase in the rate of breathing. 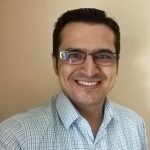 Repeated sweating, especially while feeding. Lethargy, drowsiness, and lack of energy. A weak heart or pulse rate. 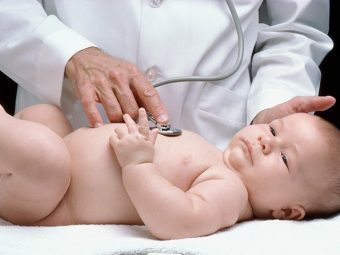 In addition to the above problems, the baby will also have a heart murmur that a doctor can detect using a stethoscope. Symptoms of heart defects mostly arise because the heart is unable to pump adequate oxygenated blood to different parts of the body. These symptoms are evident and unlikely to go unnoticed. Should you notice the symptoms later, then take your baby to a doctor soon. 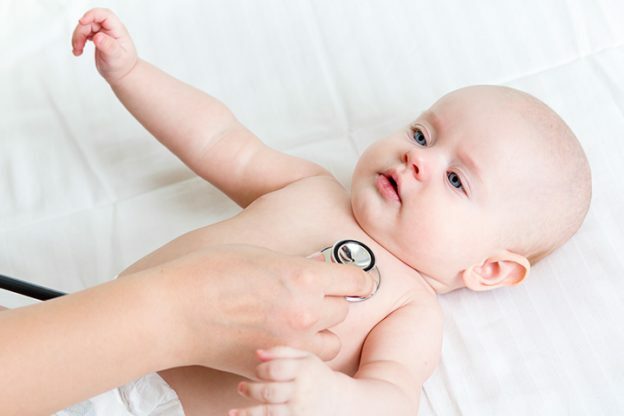 Listening to the heart and observing the symptoms: One of the first things the doctor will do is listen to the baby’s heartbeat using a stethoscope. The doctor will check for heart murmurs or unusual heart beat. The symptoms also tell them if anything is wrong with the baby’s heart. Chest X-ray: If a heart defect is suspected, then a chest X-ray helps provide a basic picture of the anomalies present. Pulse oximetry: Pulse oximeter is a clip-like device that attaches to the fingertip. It allows for the measurement of the oxygen saturation levels in the blood. If the oxygen levels are lower than usual or unusually low, then the doctor can suspect a heart defect. Echocardiogram: It is a chest ultrasound. The doctor will place an ultrasound probe on the baby’s chest and check for heart defects through the ultrasound image generated on the monitor. Electrocardiogram: A set of small plastic electrode leads are attached to different parts of the torso and the limbs, and to a machine through wires. The electrodes then measure the electrical activity of the heart while the machine displays the wavy heartbeat graph. Doctors can see this graph and determine if there is something wrong with the heart. MRI of the heart: If a clearer picture of the heart is needed to make a diagnosis, then the doctor may perform a magnetic resonance imaging test. Heart catheterization: A tube called catheter is inserted into a vein from where it will be pushed to the heart. Usually, the catheter is inserted in one of the larger arteries and veins found around the groin region. A catheter with a camera or an electrode can help give detailed information about the internal functions of the heart. In most cases, there will seldom be a need for an MRI or heart catheterization since the diagnostic steps before it would be sufficient to identify a congenital heart defect. Yes. Your doctor can specifically look for congenital heart defects in the fetus during ultrasound scans throughout the pregnancy (18). Regular ultrasound procedures will help ascertain it. If a heart defect is suspected, then the doctor will suggest fetal echocardiography that can help detect specific problems (19). An accurate diagnosis can only be made after the birth of the baby, using elaborate diagnostic tools. Nevertheless, diagnosis during pregnancy allows parents to be prepared for treatment after the birth of the baby. How Are Congenital Heart Defects In Babies Treated? Medication: Some heart defects can be rectified by medication alone. Doctors may prescribe a combination of medicines that can help cure the defect in the heart. Catheter insertion: If surgery is required, then doctors will prefer the non-invasive catheter-based procedures. A catheter is inserted through a hole in the skin and into a vein from where it reaches the heart. Such procedures can be particularly useful in repairing the tiny valves that can be reached through thin catheter tubes. Surgery: If the condition is critical, then an open heart surgery will be needed. It is an invasive and elaborate procedure. In most cases, the baby will have to stay in intensive care for several weeks after surgery. Surgery is used as a last resort by doctors when nothing else seems to work. Yes, in a few cases. Less-complex heart defects may rectify on their own as the baby grows older. The baby may need medications and regular doctor check-ups until then. Sometimes an operation may be necessary. But the doctor may not operate on the baby immediately and will wait until the baby has attained a specific age. Changes at home and in routine: Children with congenital heart defects can have a tough time doing mundane things, such as climbing the stairs, that other children do with ease. For children with CHD, any activity that requires physical exertion can be taxing because of poor circulation of oxygenated blood in the body, which reduces oxygen supply to the muscles that need to perform the actions. Certain changes like moving the child’s room to the ground floor and avoiding games that demand physical exertion can be helpful. Be extra careful about hygiene: Those with CHD are prone to infections due to weaker immunity, often a result of the heart defect. Take precautions and teach your child the importance of washing hands after using the bathroom and before eating. Keep the surroundings clean and stay up-to-date with all vaccinations for your child. Children can live a normal life: Thanks to the advancement of medicine and technology, children with heart defects can lead a normal life. Your child will always have a list of things to do and avoid, but they should also be allowed to do little things that kids their age enjoy. Reach out to a support group: You will need support from your family and others to cope with the lifelong management of your child’s chronic heart defect. Children who have their heart defect corrected during infancy also need monitoring for the rest of their lives. Since CHD treatment can be expensive, it is good to have a support network of family members and other groups that provide dedicated help to families of CHD patients. You can ask your doctor for more information about it. Are There Ways To Prevent Congenital Heart Defects In Babies? There is no single method to prevent congenital heart defects in babies, and there is still a lot of ongoing research on this matter. Since the condition is present right at birth, the mother has to adopt some preventive steps during pregnancy, to reduce the risks (21). Do not smoke: Smoking during pregnancy is linked to several congenital disabilities, and congenital heart defects are among them (22). If you smoke, then quit smoking before you conceive to minimize the risk of any problems in the fetus. Avoid alcohol: Alcohol may cause complications in the health of the fetus, and it is best to avoid it entirely during pregnancy. Consult a doctor before having any medication: Some medicines may cause congenital disabilities in the baby. Always consult a doctor before taking any medicine, especially the over-the-counter drugs. Vaccinate against rubella and influenza: The infections of rubella and influenza (flu) during pregnancy can cause birth defects, including congenital heart defects, in the baby. Get vaccinated against Rubella a month before you conceive and influenza any time during pregnancy (23). Have vitamin B9 supplements: Intake of 400 mg of vitamin B9 (Folic acid) every day throughout your first trimester reduces the risk of the fetus developing heart defects. Control diabetes: If you have diabetes, then monitor your blood sugar and keep it under control. A spike in blood sugar or a drastic drop in it can cause complications in healthy fetal development. Avoid exposure to harmful chemicals: Ingesting or breathing harmful chemicals can increase the risk of congenital disabilities. Congenital heart defects are among the most complex birth defects that can cause life-long problems. However, the condition can be rectified with prompt diagnosis and treatment, and life-long monitoring to prevent any complications.